Bournemouth XI: Boruc, Daniels, Cook, Francis, Smith, Gosling, Arter, Surman, Ritchie, Stanislas, Murray. Palace XI: Hennessey, Ward, Dann, Delaney, Souare, Ledley, McArthur, Puncheon, Mutch, Zaha, Campbell. So, a low-key start to the busy festive period for these sides. Thanks anyway for joining us, head on over to the main Saturday live for reaction to the day's other games, and build-up to Newcastle-Everton and Southampton-Arsenal. It's all over. Bournemouth's three-match winning run is over, they have to settle for a point. Last change for Bournemouth. Yann Kermorgant replaces Dan Gosling. Three added minutes. Palace have a free-kick 10 yards inside the Bournemouth half. Palace pushing harder for a winner here and that might be the closest they've come in this second half. Pape Souare curls a cross in from the left and Marouane Chamakh gets the faintest of flicks, but Artur Boruc holds it. A ninth corner for Palace but there's some shoving in the area and another set-piece opportunity comes to nought. Rantie wants too much time to get his shot away on the edge of the area and Jedinak dispossesses him. Looking for any pointers? Well, Palace have scored winning goals in the last 10 minutes on four occasions this season. This one's not over. Mile Jedinak is in the right place to block Adam Smith's cross. Bournemouth are coming on strong though, and Tokelo Rantie forces Pape Souare to concede a corner. It comes to nothing. Rantie has looked lively since coming on - he buys himself a bit of space in the penalty area, but his shot is deflected just wide. Now, this could be interesting. Damien Delaney blocks a Tokelo Rantie cross, but looks to have done himself a bit of an injury - and Palace have made all their changes. He's going to try and continue. Jason Puncheon wins a corner, Palace's eighth, but the delivery is poor and Bournemouth break upfield. Since that early Delaney effort was cleared off the line, Palace haven't really made the most of their set pieces, usually a strong point for them. BBC Sport's Mark Mitchener at Vitality Stadium: "A smattering of applause from the Palace fans, who give another rendition of their Glenn Murray song as Bournemouth's ex-Eagles striker departs. His replacement, South Africa international Tokelo Rantie, last found the net for Bournemouth in October 2014. 'If Rantie scores, we're on the pitch' is the home supporters' latest refrain." Crystal Palace make their last change - midfielder Mile Jedinak is on in place off Joe Ledley. A like-for-like change, right down to the matching beards. Crystal Palace knock the ball around menacingly on the edge of the box, but Bournemouth are reprieved when Wilfried Zaha illegally levers Matt Ritchie off the ball. No surprise - Glenn Murray has had a poor afternoon and he's hooked. Bournemouth manager Eddie Howe sends on South Africa international Tokelo Rantie in his place. Lovely work by Wilfried Zaha in heavy traffic, but then his pass lets him down, attempting to find Chamakh over the top but not clearing the centre-backs. That's better! Matt Ritchie gets to the byline and fizzes in a low cross, which is turned behind for a corner. From the set piece, Wayne Hennessey flaps a bit at the cross and is relieved to get a second chance to gather the ball. Marouane Chamakh comes on to make just his fourth appearance this season. Fraizer Campbell is off for Palace. Dear oh dear. Glenn Murray hasn't looked sharp at all today. He looks poised to lead a Bournemouth counter but his touch is far too heavy and the ball bobbles to Scott Dann, who clears. This is pretty low-key fare, I'm afraid. Junior Stanislas has just booted a free kick straight out of play. As so often happens, a clash between two of the league's form sides is not living up to the billing at the moment. Glenn Murray's clever flick sends Dan Gosling skittering into the area, but he tumbles to ground instead of getting a shot away. No penalty there. BBC Sport's Mark Mitchener at Vitality Stadium:"Eunan O'Kane has had to wait patiently for his opportunity in the Premier League, stinging the palms of Wayne Hennessy early in this second half, and Glenn Murray will have hoped to do better than that tame shot at the Palace keeper after Gosling's forward run. But Palace are surging forward at every opportunity too. Don't take your eye off this game." Dan Gosling gets away from Damien Delaney and tees up Glenn Murray, but the striker's effort is tame, dribbling weakly into the gloves of Wayne Hennessey. Was that his golden opportunity to score against his old side? What an excellent introduction from Eunan O'Kane! Simon Francis does really well to waltz his way through a couple of tackles and set up the young Irishman, who stings the gloves of Hennessey with a fizzing drive. BBC Sport's Mark Mitchener at Vitality Stadium:"Harry Arter's half-time replacement by Eunan O'Kane looks like possible damage limitation from Bournemouth, with the all-action midfielder on a yellow card - while Palace's introduction of Yohan Cabaye, preceded by several minutes' worth of instruction from clipboard-wielding assistant manager Keith Millen, looks like a tactical switch with Cabaye sitting deep in midfield." Excellent defending from Adam Smith. He nicks the ball off Jason Puncheon, sets off and draws the foul as the Crystal Palace tries to win it back. And we're back under way. Yohan Cabaye is coming on for Crystal Palace in place of Jordon Mutch, while Bournemouth's Eunan O'Kane replaces Harry Arter, who was walking a bit of a tightrope. BBC Sport's Mark Mitchener at Vitality Stadium:"It's a grey, overcast day in Dorset but Christmas panto season is in full swing here as both sets of fans have identified today's pantomime villain. For Palace, it's Harry Arter, whose every touch is booed after that yellow-card challenge on Wilfried Zaha. Meanwhile, the Bournemouth fans are booing Zaha for his part in the scuffle that followed. End-to-end excitement here... He's behind you!" Daily Mirror football reporter Ed Malyon reckons Bournemouth are lucky not to be down to 10 men after that Arter challenge. Harry Arter is trying to kiss and make up with Wilfried Zaha as the teams troop off. Zaha is having precisely none of it. And that's the interval. Crystal Palace started like a train, then Bournemouth came back into it very strongly. A handful of opportunities for either side but goalless at the break. Jordon Mutch is causing a few problems in the penalty box. Again he gets across his man as Pape Souare sends in a delivery, but again he can't get the right contact. And now a decent chance at the other end as Jordon Mutch makes a sharp run at the near post but glances his header just over. Ooh, what a good chance for Junior Stanislas. Charlie Daniels slides in a low centre and Damien Delaney's clearance falls kindly for Stanislas, but the winger can't get his head over the ball and blazes over. A bit of a scuffle as Harry Arter slides on Wilfried Zaha. Zaha doesn't like it and there's a bit of retaliation. Eventually it all calms down and ref Michael Oliver books Arter. Now it's Bournemouth exerting all the pressure. First Adam Smith curling cross from the right almost induces Damien Delaney to slice into his own net, then a deflected effort from Dan Gosling loops up menacingly and Wayne Hennessey does brilliantly to claw it away from the top corner. Bournemouth have a free kick in a dangerous area, but the referee spots a crafty push by Glenn Murray and the chance is lost. Now then! Junior Stanislas rolls a cheeky angled pass into the penalty area and the recipient, Glenn Murray, tumbles to the ground under the challenge of Damien Delaney. Nothing doing, and on second look, that looks a good decision. BBC Sport's Mark Mitchener at Vitality Stadium: "The away fans serenade Bournemouth's lone striker with 'Glenn Murray, scoring goals for Palace' as he chases down a loose ball. Makes a change from fans' usual bitterness towards ex-players." Another decent chance for Bournemouth as a ball is curled in from Ritchie on the right and it just evades a stretching Glenn Murray. Shades of Gazza in Euro 96. Longer studs and he would have scored. What a chance for Bournemouth! Totally against the run of play but that should have been 1-0. The cross comes in from Stanislas on the left and Matt Ritchie arriving late, nods it a whisker wide when he should have made the net bulge. Wilfried Zaha has begun to look like the player who Alex Ferguson paid £15m for. A lovely piece of skill draws a foul from Harry Arter. The free kick comes to nothing. Scott Dann tries to hit Fraizer Campbell over the top, but his pass is too strong and Boruc collects. Fine play again from Crystal Palace. Damien Delaney surges forward from the back and picks out Fraizer Campbell with a lovely early cross. The striker takes a good touch and curls an effort just over the bar. BBC Sport's Mark Mitchener at Vitality Stadium: "Palace had the better of the earlier encounters, but Bournemouth's neat build-up play for that deflected Arter effort shows they are a force to be reckoned with when moving the ball at pace." Much better from Bournemouth. Patient build-up, a nice dummy from Stanislas on the edge of the area and Harry Arter has a crack from outside the box. Comfortably clutched by Wayne Hennessey. BBC Sport's Mark Mitchener at Vitality Stadium: "Bournemouth have been indebted to keeper Artur Boruc for some terrific saves during their three-match winning run. But while that looked like another smart stop from the Pole, replays show it was the boot of Simon Francis which cleared the effort off the line." And again Palace go close from the corner! Damien Delaney slides in and his sidefoot volley makes good contact with the inswinging delivery. It's goalbound but it's cleared off the line via the combined efforts of Artur Boruc and Simon Francis. All Palace at the moment. I thought that was in for a moment! Fraizer Campbell scampers down the inside left channel and his cross takes a deflection off a defender's outstretched leg. It loops up agonisingly as Artur Boruc desperately backpedals and in the end just lands on the roof of the net. Jason Puncheon tries to lob a cheeky ball over the top, but he gets just too much on it and the ball bounces through to Artur Boruc. A second corner for Palace as Bournemouth panic as a long free-kick is floated into the box and Adam Smith puts behind. This one comes to nothing, but Palace have made a bright start. Palace win an early corner - they've got plenty of tall players to threaten from set pieces, and on this occasion it's Scott Dann who gets his bonce to it and nods over. Here we go. Under way in this clash between two of the league's most in-form sides. Almost ready to go. Crystal Palace in their white away kit, Bournemouth in red and black stripes as usual. Murray, by the way, has pledged not to celebrate if he scores today. The players are out on the pitch now and, judging by the sprinklers, there's a stiff wind whipping across the Vitality Stadium pitch. Crystal Palace could come up against a familiar foe today. Striker Glenn Murray played 113 league games in a three-year spell at Selhurst Park, scoring 44 goals. However, Murray is on the opposite side today, having moved to Bournemouth in August. Could he spoil Palace's Christmas today? BBC Sport's Mark Mitchener at Vitality Stadium: "Bournemouth and Crystal Palace last met in a competitive match on 4 March 1989, and it was a genuine five-goal thriller at Selhurst Park. "John Williams (who is BBC Radio Solent's summariser here today), Mark O'Connor and Richard Cooke had given the Cherries a seemingly impregnable 3-0 lead, only for Palace to hit back through John Pemberton and Ian Wright to set up a grandstand finish. Bournemouth held on for a 3-2 win, with Wright left to rue a missed penalty earlier in the game." We all love the Queen's Speech, but it's worth remembering that Her Majesty isn't the only silver-haired Palace leader who can deliver a rousing team-talk around this time of year. Eagles manager Alan Pardew has seen his stock rise and rise through 2015, since taking charge at Selhurst Park on 2 January - he's now even being mentioned as a potential next England manager. After steering Palace to a very creditable position of 10th last season, Pardew will be eyeing a best-ever Premier League finish for the London club this season. Some good results over the festive period would go a long way to achieving that goal. These two sides are hotter than the filling in a freshly microwaved mince pie. Bournemouth have won their last three league games and are undefeated in five, scoring 10 goals along the way. Meanwhile, Palace are second only to Leicester City in the Premier League form table, having taken 13 points from their last six matches. In that period, they've banged in 11 goals and managed away victories over Liverpool and Stoke. A win this afternoon would be the best Christmas present either side could ask for. Victory for Palace could elevate them into the Champions League spots by the end of today, while if Bournemouth pick up three points they could move as much as seven points clear of the relegation zone. "Tis' certainly the season to be jolly for these two at the moment, both are on great recent runs and have been excellent to watch as well. "Understandably, Bournemouth's back-to-back wins over Chelsea and Manchester United caught the eye, but I was also impressed with the assured manner in which they dictated the game when I saw them make it three straight victories at West Brom last weekend. "However, beating Palace - especially on their travels - is a bigger ask than seeing off Chelsea or United on current form. "At the risk of jinxing it, given how these two play and the confidence they'll both have right now, it should be an entertaining afternoon!" Bournemouth are unchanged from the side that beat West Brom last time out, with former Palace man Glenn Murray up front. Crystal Palace manager Alan Pardew makes two changes from the side that beat Stoke City - Jordon Mutch comes in for Yannick Bolasie in midfield for his league start since the opening day of the season, and Fraizer Campbell replaces Connor Wickham up front. Both Bournemouth and Crystal Palace can be happy with their team's start to the Premier League season. But their respective fans are doing even better in our Prediction League. Bournemouth supporters are up in ninth place, while Eagles fans are flying high in second. And you can help maintain your team's form by having your say in our Predictor game. Boxing Day. A day of inertia. A day to slump on the sofa with your Christmas chocs. A day to sit still. Unless of course, you're a Premier League footballer. Yes, it's back to the day job for those poor souls, as they bid to scramble up the snowy hilltop that is the Premier League table. Bournemouth and Crystal Palace were both in excellent form before Christmas. So whose gifts will keep on giving - and who will be going cold turkey? 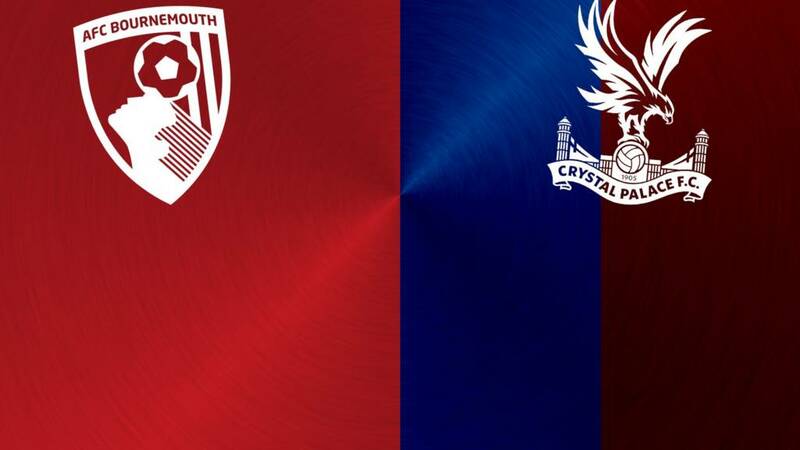 Welcome to our live page for Bournemouth v Crystal Palace. We’ll have text commentary here from 14:30 GMT. You can keep up to date with all the build-up to today’s games here.